Background: Nicotine is the main tobacco alkaloid that leads to smoking addiction. Human serum albumin (HSA) is the most abundant protein present in the circulatory system. Nuclear magnetic resonance (NMR) has been widely used for studying the interactions of small molecules with macromolecules. The proton spin relaxation rate of the small molecule has proved to be a suitable parameter in ligand– macromolecule complex studies. Objective: In-depth study nicotine interact with HSA. Method: Spin-lattice relaxation, molecular modeling, fluorescence, FT-IR and CD spectrometers were chosen for this study. Results: HSA caused a change in the H-4 and H-9 of a nicotine proton environment. The values of normalized affinity index for the H-4/H-9 proton were (7996.9 ± 374.4) and (6840.8 ± 351.6) L·mol-1, respectively. Nicotine showed a good fit with Sudlow site II, and hydrogen bonds performed a significant function in the nicotine–HSA interaction. Citric acid exerted a slight effect, whereas malic acid exhibited an evident effect on the interaction. FT-IR and CD results revealed that nicotine–HSA interaction slightly affected the secondary structure of HSA. Conclusion: Nicotine can effectively combine with HSA and influence the native structure of HSA. 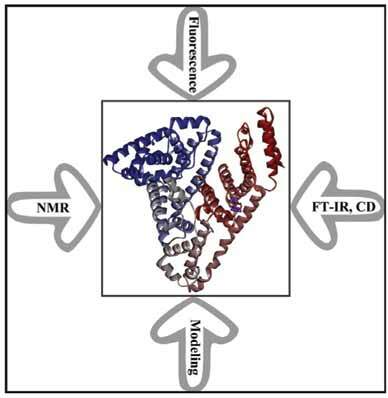 Human serum albumin, molecular modeling, nicotine, nuclear magnetic resonance, spin relaxation, structure change. Technology Center, China Tobacco Yunnan Industrial Co., Ltd., Kunming 650204, Yunnan, P.R. China., College of Chemical Engineering, Sichuan University, Chengdu, P.R. China.